The healing power of gemstones and crystals dates back to ancient Egypt and Atlantis. These stones were used to transmit, clear and direct energy for healing purposes. 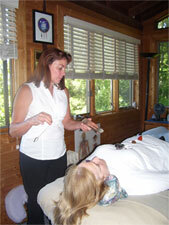 During a treatment, crystals are placed on or near the body allowing it to affect the human electromagnetic field. When light responds to the stones, color vibrations and sacred geometry are reflected back into the aura healing the chakras. Greater personal empowerment and balance in the enteric bodies are achieved with Crystal Therapy.